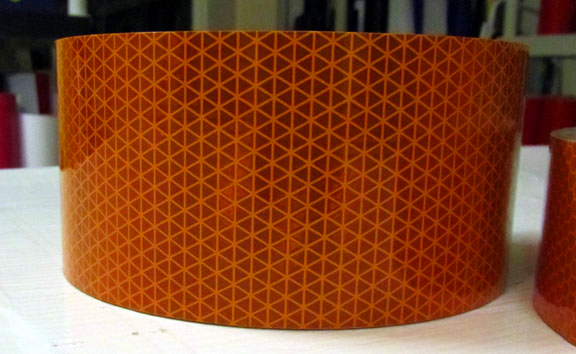 General articles on reflective tape applications, regulations and studies. Accidents involving vehicles are one of the leading causes of death due to injury in the United States and around the world. (source – NHTSA) In most cases, these accidents are the unfortunate result of one driver not seeing another automobile, pedestrian, bike rider or motorcyclist in time to stop or avoid hitting them. Simply put, increasing visibility day and night increases reaction time which in turn substantially reduces the number of injuries and fatalities. 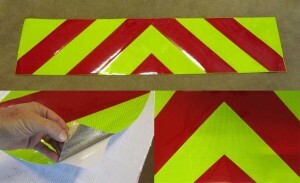 Brightly colored reflective tape is the main method of increasing visibility day and night. 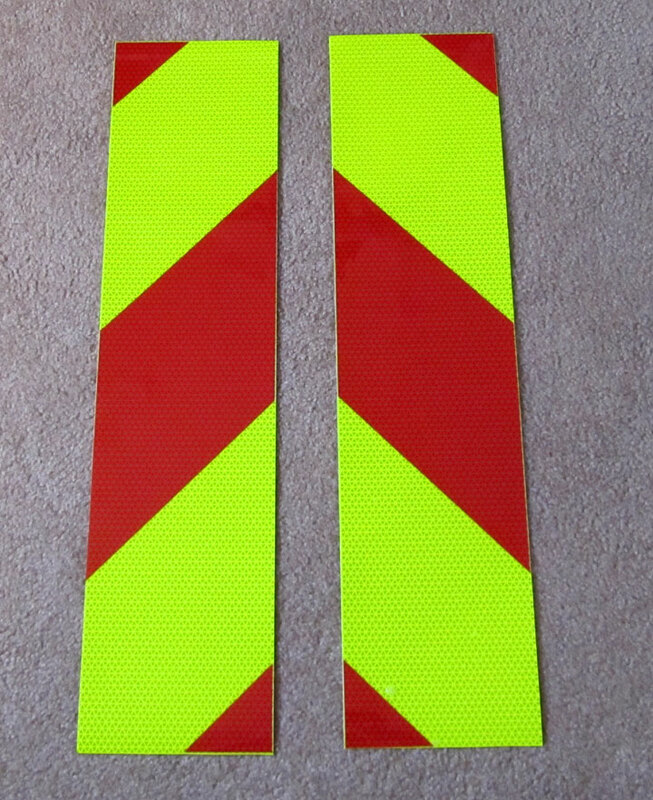 There are two choices when selecting a reflective tape, glass bead or prismatic. 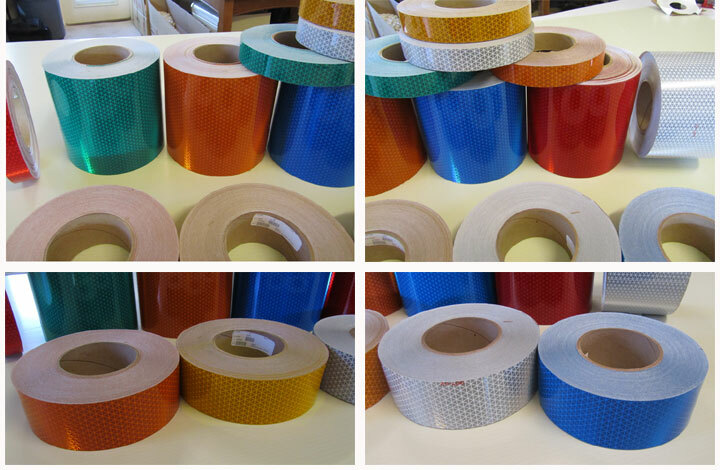 Roadway applications require a tape that can be seen from long distances and prismatic reflective tapes in bright colors can be seen much farther than standard glass bead reflective tapes. (Thousands of feet instead of hundreds.) The colors below represent the most visible day and night. 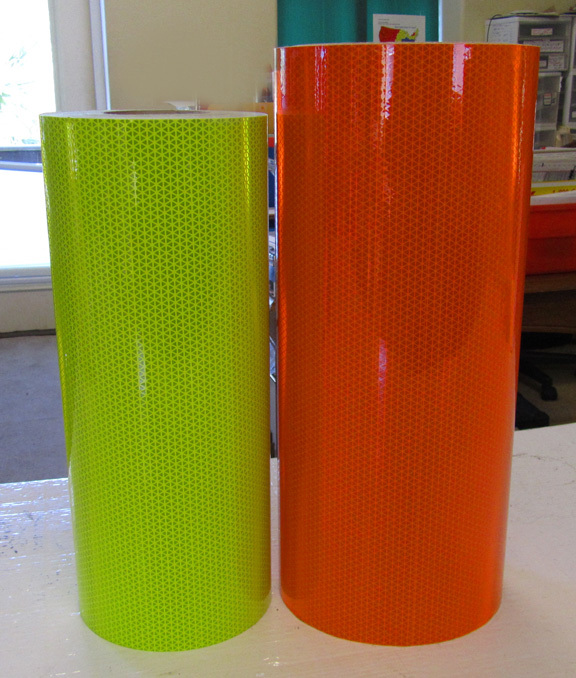 These colors can be combined to create contrasting areas of reflective tape or used alone. Combining colors can greatly increase the visibility of a vehicle. A battenburg or chevron panel is very effective. If you choose to use a single color a Fluorescent Lime is recommended on a darker background and a Fluorescent Orange is recommended on a lighter background. I prefer the Reflexite V98 conformable prismatic over all other tapes because of its flexibility, durability and brightness. 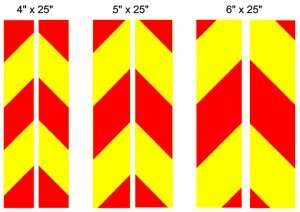 For more information or to purchase go to www.tapedealer.com . Reflexite V98, V92 and V97 prismatic reflective films by Orafol are very similar in appearance but have some distinct differences. Each have specific characteristics that make it most suitable for certain conditions. The one you select will depend on your application. To summarize you would use a V92 film when striping flat areas where high initial tack is needed. You would use V98 where conformability is needed to go over complex curves. Reflexite V92 prismatic and V98 prismatic tape are about the same brightness. The chart below shows the reflectivity in candelas for the V92 and the V98 is going to be about same or slightly higher. Note that the chart below shows minimum values. Actual reflectivity is normally about 35 – 40% higher than the chart. Both tapes are very bright and can be seen from over a thousand feet away in many applications. Reflexite V98 and V92 tapes are both metalized polyester films. The V92 film is thin and flexible while the V98 film is engineered to be “conformable” as well as flexible. Conformable simply means that the film will stretch or give a little. 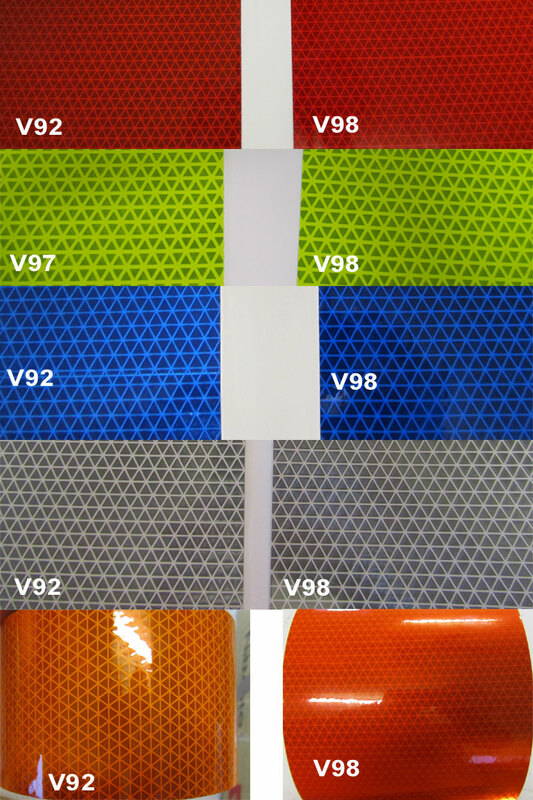 V92 films are fine for flat surfaces or surfaces without compound curves. V98 films are designed to perform on flat surfaces as well as surfaces with compound curves. It is important to note that when you install the V98 material you do not want to stretch it like a rubberband and install it. If you do it will pull back to its original shape. To take advantage of the V98 materials conformability you would apply it to a surface, warm it with a hair dryer and mold it to compound curves using a soft cloth. 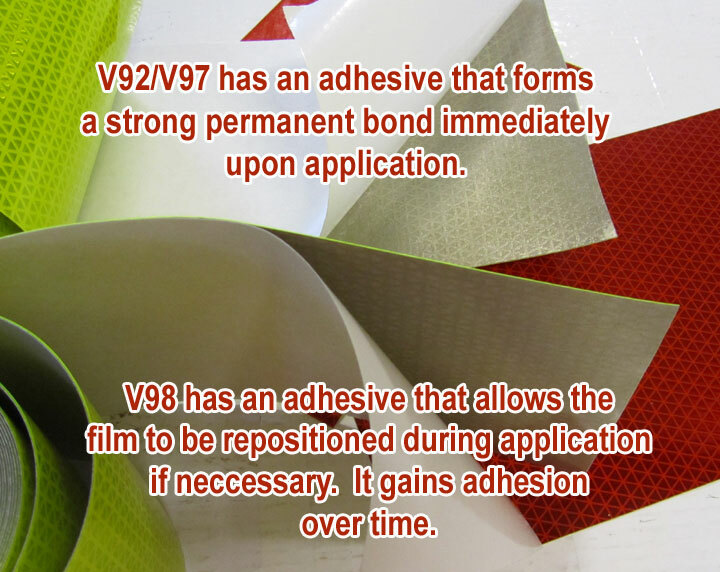 V92 and V98 films utilize two different types of adhesive. V92 adhesive grabs immediately and does not want to let go. It is very strong making the tape great for applications where a high initial tack is needed. 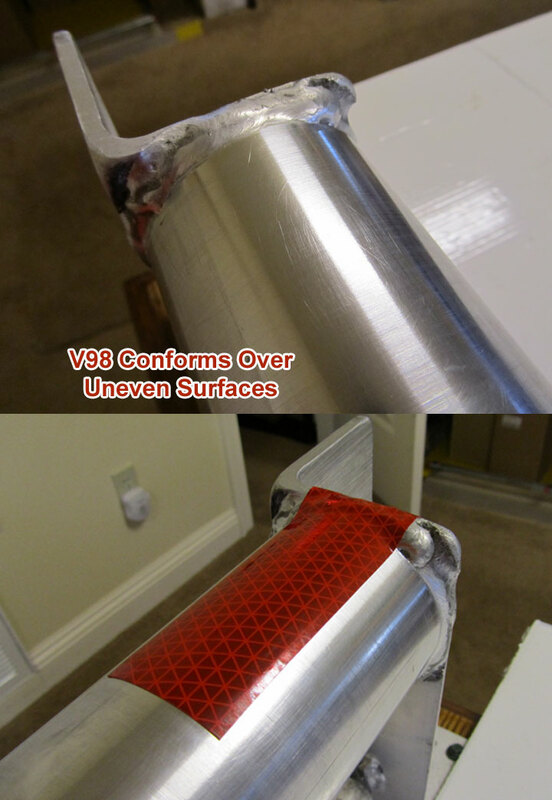 The V98 film uses a repositionable adhesive meaning it is less tacky initially and allows the installer to pull it off an reapply if necessary. The V98 films gain adhesion over time. If removal at a later date is necessary, the V98 will come off easier and leave a cleaner surface. Orafol-Reflexite V92 is less expensive than V98. 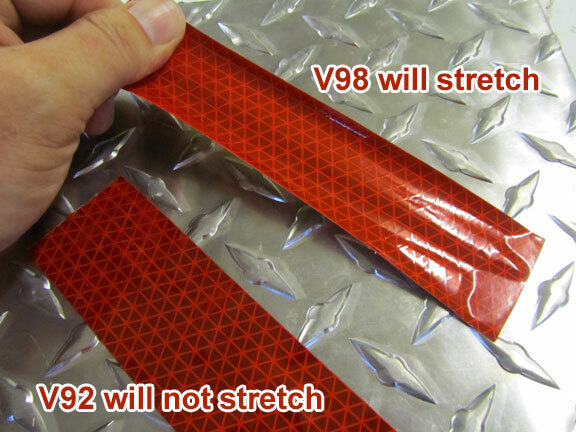 If you want a bright and tough yet affordable tape then V92 is the solution. The V98 is more expensive but if you need a conformable product that is brighter then it is the way to go. Orafol-Reflexite V92 film is very thin. About .008 of an inch thick. This is about like a couple of sheets of paper. For certain applications a thin film is desirable. V98 is about twice as thick. This is still very thin but it is thicker than V92. Reflexite invented prismatic tape and they make it in a single patented layer which is why it is thinner than the competition. 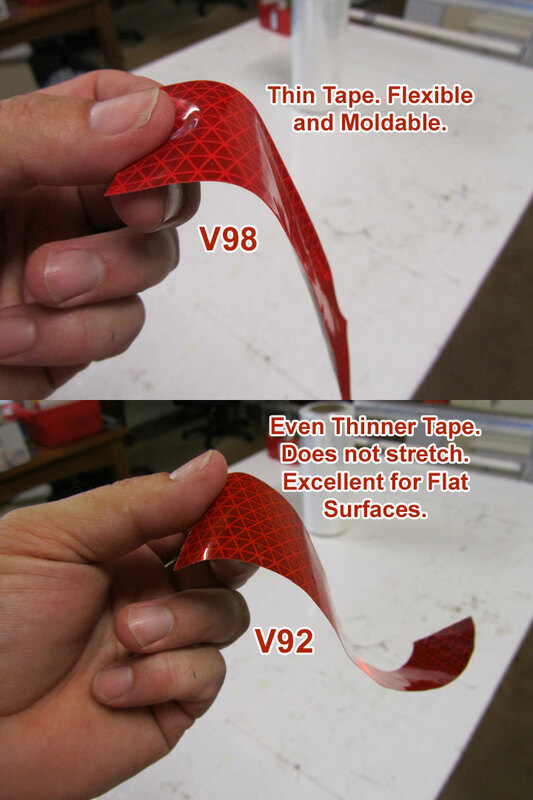 The single layer design also means that V92 and V98 tapes will not delaminate like other films. V92 and V98 films look almost identical. For some colors a slight difference can be seen. Note – The V98 Orange that we carry is a Fluorescent Orange. Our V92 Orange is a standard Orange. That is why the two colors look different. According to the US National Highway Traffic Safety Association, each year in the US there are approximately 5.5 million automobile accidents resulting in over 30,000 fatalities. About 1/3 of these accidents involve rear end collisions. Rear end collisions occur when a driver does not see a slower or stopped vehicle in front of them in time to stop. The US Department of Transportation reports that there approximately 400,000 accidents involving “large trucks” (GVWR > 10,000 lbs) each year. 5,000 of these accidents result in fatalities, 109,000 result in some type of bodily injury and all resulted in property damage. Out of these accidents, rear end collisions result in a higher percentage of injuries, fatalities and property damage. Keep in mind that these number are just for large trucks. Another fact to consider is that about 50% of fatalities occur in the day and about 50% occur at night indicating that day and night time visibility are equally important. 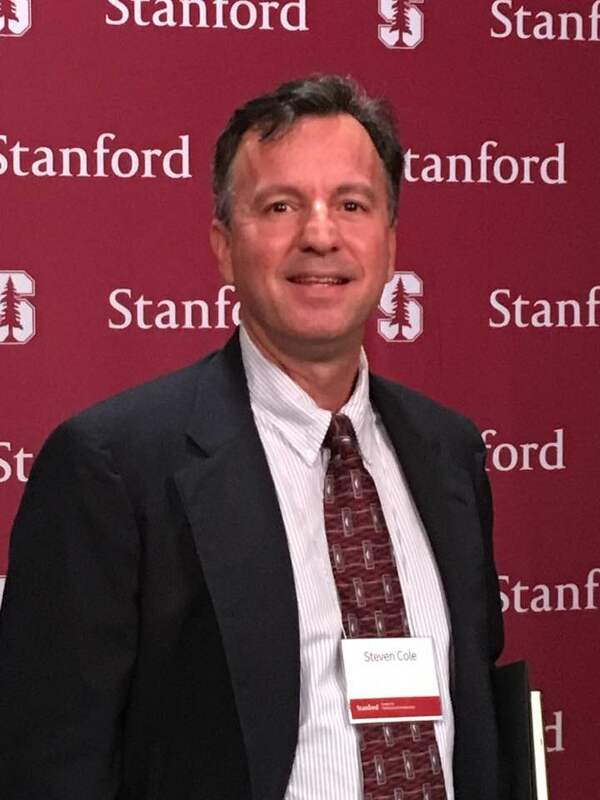 Commercial businesses with fleets of vehicles, Utility Companies, Police Departments and Emergency Service Organizations all have to deal with the cost and liability of highway accidents involving their vehicles. These types of vehicles are at higher risk because of their tendency to stop near moving traffic. As you drive each day you will no doubt come across vehicles that you have to slow down and avoid. These would be ambulances, school buses, fire trucks, police cars, utility trucks, cable company vehicles, delivery trucks, gas company trucks, oil and fuel trucks, snow plows, garbage trucks and other such vehicles. Seeing these vehicles early can prevent a collision. Consider this example. Everyone is familiar with the brown UPS delivery vehicles. They are everywhere. Lets say that it is getting dark and you round a curve at 30 mph and there before you is a large brown ups van parked in the road. Since the van is brown it blends in very well with the dark night. What is it that keeps you from hitting the UPS vehicle? Now lets say you round the same corner and see the same truck but with bright yellow and red alternating stripes marking the rear of the vehicle. You will now see that vehicle and be able to slow down in time to avoid a collision. The point is, visibility is important. The colors of the material to be used. The Intensity or brightness if Reflective material is used. If you have been researching making a vehicle more visible you have no doubt come across the word “conspicuity”. As in conspicuity tape or conspicuity treatment. Conspicuity is defined as the characteristics of an object influencing the probability that it will be detected by coming to the attention of an observer. In other words, it is how easily something can be seen. For example, a bright yellow Ferrari is more conspicuous than a black one. 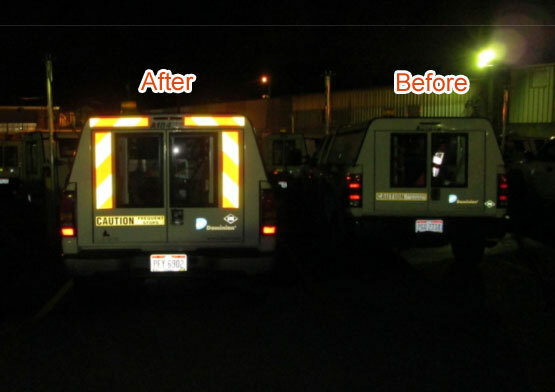 When marking commercial vehicles the goal is to make them more visible or conspicuous to the human eye. Color and luminance contrast are two factors that affect conspicuity. These factors are often what trigger recognition of an object. The average human has an approximate 130 degree field of vision. Our central field of vision is where we see detail. Our central vision field makes up only 5% of the 130 degree field. Our periphery vision makes up the rest. Color alone is not sufficient to locate or distinguish objects in our peripheral field of vision. To detect objects in this area we need contrast and luminance as well as color. Luminescence is defined as the summed emission of visible light by an object, substance or material. In other words it is how bright or vivid something is. In this case we are interested in the visible light reflected from a surface to the human eye. The luminance of object depends on how much light strikes and object and how much is reflected. (Some materials reflect more light than others.) Luminance contrast is simply the difference in the brightness of two colors whether it be two colors side by side or one color in front of a dark or bright background. 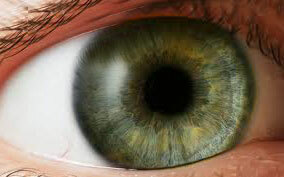 The human eye distinguishes color and luminance through two types of photoreceptor cells. Cones and rods. Cones are more concentrated at the center of the eye while rods are more towards the outside or periphery. Cones distinguish color and detail. Rods are more sensitive to changes in luminance or movement. Rods require less light to function and are more efficient at night. Cones give us our central vision (color and detail) Rods give us our peripheral vision. As you read this article, it is the cones in your eye that allow you to see the detail and contrast which is what allows you to see and read the words. As you focus on the words you will notice that you are also taking information in from your peripheral vision. This information is coming from the rods in your eye. If while you are reading this sentence, something moves in your periphery, you will notice it. Also, if there is a bright color that is out of the ordinary, you may see that as well. Try this. Click on the yellow and red picture above to make is larger. After you click on the image look 30 – 45 degrees to the right or left and focus on something besides the screen of your computer. Notice how in your periphery vision you can still see the bright yellow and red graphic. In the daytime, the color of an object determines how bright or luminous it is. At night, with reflective sheeting, color and type both play a role in how visible the sheeting is. By type I mean the brightness of the reflective tape. (type 1, 2, 3, 5, 8) For example, a prismatic reflective material (type 5 or above) will be about 5 times brighter than a standard engineer grade (type 1) material. So at night, both color and type affect visibility. Because of this, we recommend a prismatic tape over the less intense tapes. Color is determined by which wave lengths of light are reflected back to the human eye. The wavelengths or combinations of wavelengths give us what we know as color or hue. Colors such as Fluorescent Lime/Yellow and Fluorescent Orange are considered to be the most conspicuous colors during the day and in low light conditions. Definition of Fluorescent – the emission of light by a substance that has absorbed light or other electromagnetic radiation. It is a form of luminescence. Fluorescence makes a color look as if it is glowing. They are more conspicuous in both the primary and periphery field of vision. The main fluorescent colors are lime/yellow and orange. Fluorescent lime is commonly seen in school zones and fluorescent orange is seen in work zones. Fluorescent colors are especially visible at twilight or dawn when the ultraviolet light from the sun is present in great proportions than in full sunlight. Standard Red, Orange and Yellow are also conspicuous colors. Red and Orange are useful as contrasting colors with fluorescent lime or yellow being the alternating color. Brightness or Luminance is important but contrast is also needed for objects to be conspicuous. If you sheeted the back of a truck with just fluorescent lime or standard yellow material you would certainly make it more noticeable. However, by adding a contrasting color such as red or orange you greatly increase the trucks visibility in both the periphery and primary fields of vision. Red is often used with fluorescent lime yellow as a contrast color and is very effective. The most visible reflective panels would be red and fluorescent lime/yellow or orange and fluorescent lime/yellow. It is difficult to say which is the most visible. I would lean a little towards the lime/red because of the contrast. The picture below shows the three colors. Fluorescent lime and red will give you a 3 to 1 contrast ratio. Fluorescent lime and fluorescent orange will give you a 2 to 1 contrast ratio. Fluorescent lime and standard orange will give you an approximate 2.5 to 1 ratio. Reflective Fluorescent Lime and Orange. Along with Reflective Red. For maximum visibility we recommend you use a fluorescent lime/yellow material and a red or fluorescent orange or standard orange contrasting material. The chevron pattern is recommended but an alternating non slanting pattern is also effective. A chevron pattern slants down and out at 45 degree angles which is normally going to be different from other lines on a vehicle and therefore more conspicuous. However, there is no research that I know of that shows the chevron pattern to be superior to a simple alternating pattern. The main considerations are the brightness of the tape and the contrast. Part Three of this series of articles will discuss the size of the panels, the type (slanted or non slanted) and the placement on the vehicle. Note – With that being said let me just mention that white is brighter but it does not stand out as a conspicuous color. It tends to blend in with white backgrounds, car headlights, street lights, the moon, etc..
Fluorescent Lime is a very unique color and is not common in what we see day to day or at night. Fluorescent Orange is also like this. Both of these colors get peoples attention because they are unusual and bright. Of these two colors the brightest would be the lime. 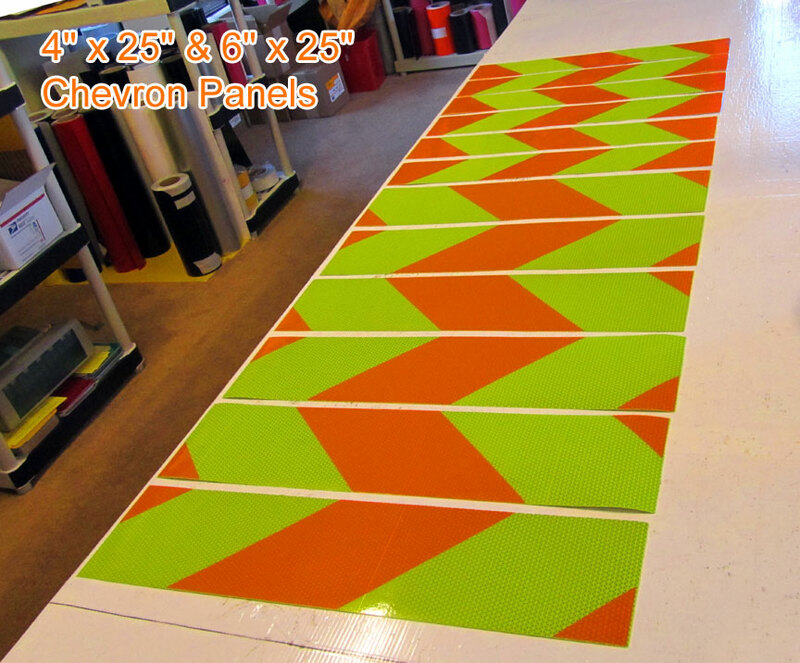 The image above shows fluorescent lime and orange panels. Notice that you still have nice contrast and both colors are very bright at night. As an offsetting color for fluorescent lime you would want to select a red, a fluorescent orange or a standard orange. By alternating these colors you would provide the highest contrast using the most conspicuous colors. This makes you visible and safe both day and night. In summary, to be seen day and night use red and fluorescent lime reflective material or orange and fluorescent lime material. When placing the panels on a yellow or red vehicle you can change the lime to a white and then use orange or red as the offset.